4-axis motorized stage with translation and rotation function. Travel range of x, y, z axis stage is 150mm to 400mm. 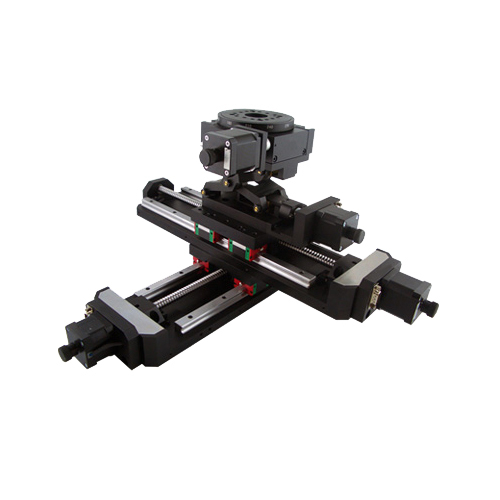 The 4-axis motorized stage is combined by three motorized linear stages and one motorized rotation stage. It provides four degrees of freedom adjustment. By using our motion controller, customer can control the stage automatically. We can assemble all kinds of multi-axis stage according to customer’s requirement. Please contact us if you have other special requirement on the multi-axis stage. We will provide suitable solution for you. The xyz stage can also be stacked by MOX-06-200, MOX-06-300 or MOX-06-400. Please click the model number to get more information.